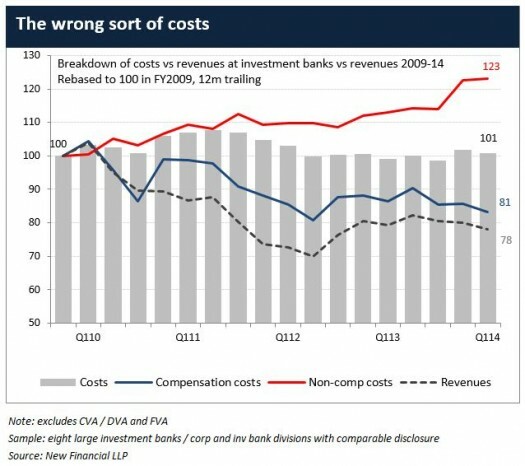 The investment banking industry has lots of problems, but few of them are as intractable as its problem with costs. 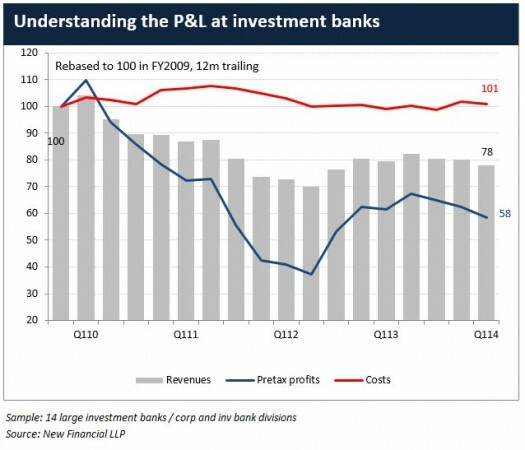 For all of the talk of tough decisions and headlines about slashing costs and culling jobs across the industry over the past few years, investment banks have been running hard to stand still. Short of a miracle recovery, investment banks may soon have to start taking more radical decisions about cutting costs and restructuring than most of them have even begun to consider. Unless they come up with a more sustainable business model, it will become ever harder for investment banks to persuade shareholders, clients and policymakers of the value of what they do – and to give them the benefit of the doubt. In other words, the net effect of the perpetual restructuring, ruthless cost-cutting and brutal rounds of redundancies over the past few years has been…precisely nothing. Costs are right back where they started. You might say that costs are lower today than they otherwise might have been, but that’s not really the point. 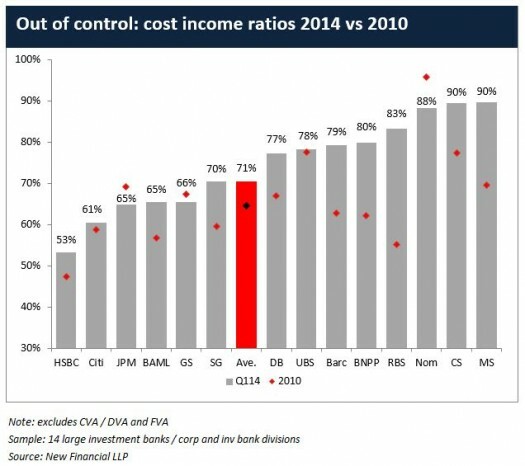 What is most worrying about these numbers is that investment banks are supposed to have flexible cost bases, and costs are supposed to be the one thing they can control. In presentation after presentation, senior bankers have said that while there is not a lot they can do about their revenues, they can at least get a grip on their costs. Or perhaps not. 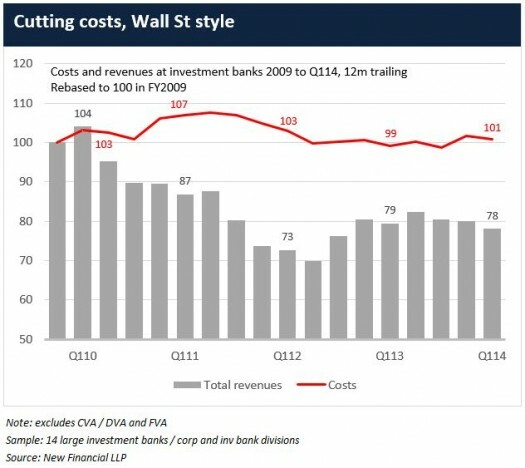 These less obvious costs – ranging from IT spending and office space, to legal fees and restructuring (the cost increases to achieve cost cuts) – are what are really killing the investment banks. The problem is that by definition, many of these other costs are less flexible than pay. Just because you fire 1,000 staff doesn’t mean that you stop paying for the office space they occupied. Much of the IT infrastructure that supports banks runs on longer contracts than the employees do. And many banks are furiously investing in an IT arms race to replace many of the basic functions performed by staff in future – particularly around electronic trading systems – even if it means that banks have to carry the increased costs today. This means that bringing costs under control will not be as easy as cutting bonuses, firing a few thousand more staff, or paring back a few more business lines. Perhaps a clue to the problem is that for all of the job cuts, at lots of investment banks the number of staff refuses to budge. Announcing that you are going to reduce headcount by a few thousand staff is a little harder than actually doing it (as Barclays is likely to find out): IT and compliance staff breed like rabbits, and for every senior banker or trader that you fire, another couple of juniors pop up to take their place. Across a small sample of investment banks that provide comparable information on headcount, staffing levels across the industry are flat on where they were in 2009. Most of the cuts have been reversing the premature decision by lots of banks to hire in 2009 and 2010 when they assumed the crisis was already behind them. The average headcount over the past year in the investment banks at Barclays and Credit Suisse is higher than in 2009, as it is at Goldman Sachs. The only two investment banks to have significantly reduced staffing are RBS and UBS, which have both been forced for different reasons to take more radical strategic decisions than they might otherwise have chosen. So perhaps a more radical and strategic approach is needed. That could include banks rethinking what they want the business to look like in 10 years time, hammering entire divisions together (such as fixed income and equities), pulling out of entire markets and business lines, outsourcing essential but non-proprietary parts of their business (such as client on-boarding), looking at non-traditional suppliers (such as opensource software), or even pooling resources with other banks in areas like IT development and the back and middle office. All of this would cut billions of dollars in duplicate costs out of an industry that needs to watch every cent that it spends. (Here’s a link to an article I wrote on the subject last year). The fierce competition between investment banks and the embedded interests within them mean that it is unlikely that Goldman Sachs and JP Morgan are going to merge their back office anytime soon. But their current model isn’t working out so well. A few more quarters like this and they might just start getting radical on their costs.